Today, I got my new passport. It smells gooood! 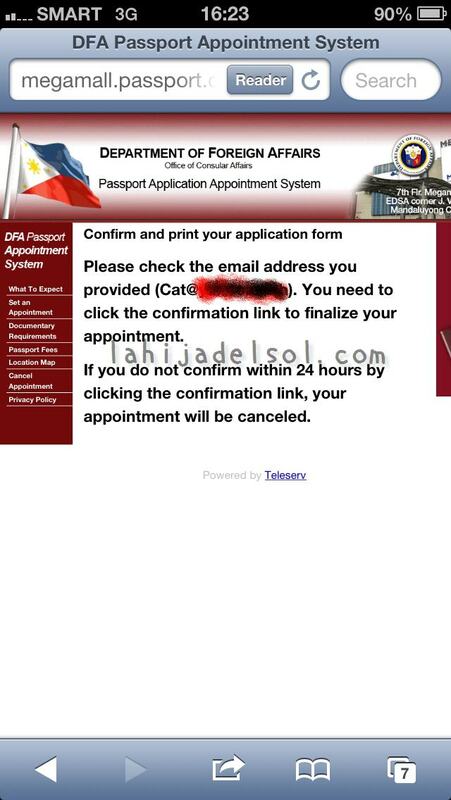 My old one will expire in May and I have an upcoming trip so I needed to go ASAP to DFA to get it renewed. 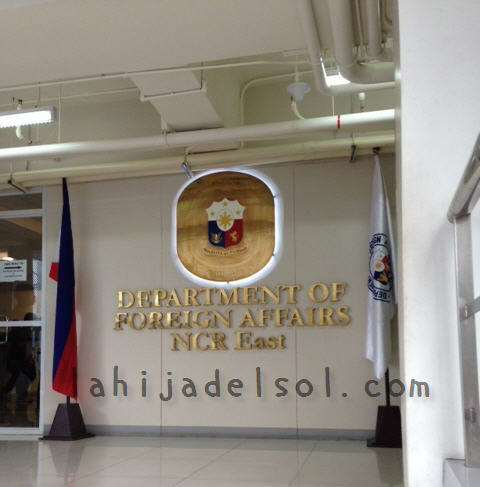 The passport renewal process at DFA is so different from way back in 2008, when I visited the main DFA office in Pasay. So many huge improvements. Talk about strides! Yay for correctly using taxpayer money! 2. Click “Set an appointment” from the left menu. 3. Choose your DFA location. 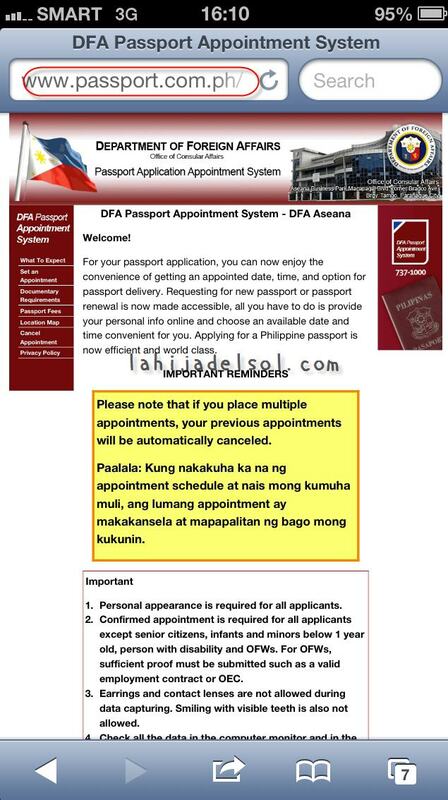 Note that this online process is only applicable to these DFA offices. 4. Input the 2 words in the reCaptcha area near the bottom of your screen. 5. Click on “Start individual appointment process”. 7. The next page will show you the documents that you need to bring with you on your appointment. Take note of these and click “Continue” at the bottom. 8. Choose an appointment date and time. You need to click on the calendar until you find a date with available slots. The screen will show which schedules are available. Select one. 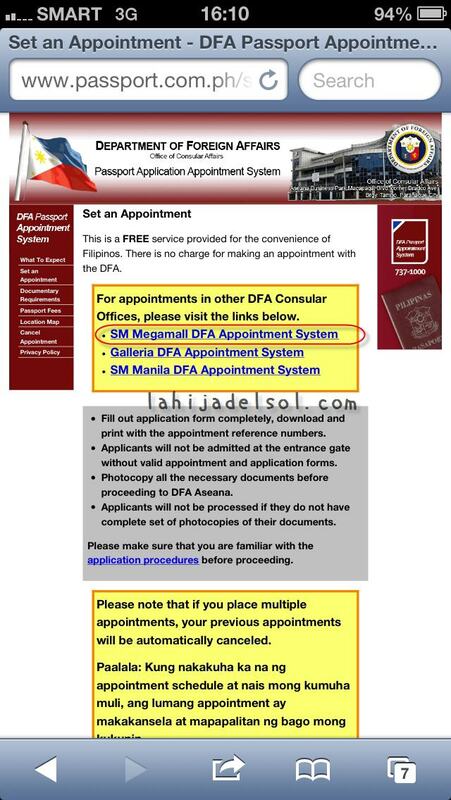 You need to click the link in the DFa confirmation email to finalise your appointment. Print your DFA form on long bond paper. 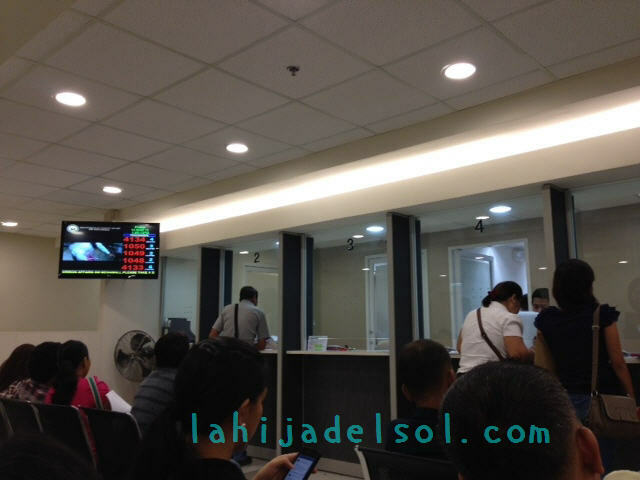 After that, you just have to wait for your appointment date and head to DFA Megamall with your documentary requirements (including photocopies) and printed appointment confirmation. Note that you do not need to bring passport pictures. On the day of your appointment, make sure that you are at SM Megamall at least 30 minutes before your schedule. Step A: Verification – present your printed appointment form to the desk labeled Step A. The officer will scan the bar code on your form and will instruct you to get a number from a ticket machine and to proceed to the Processing Section. Step B: Processing – This section is a big air conditioned room with several rows of seats. Pick a spot and wait for your number to be flashed on the screen. In the meantime, watch whatever show they have on the TV. When I was there, they had this Indian show on. I don’t know why. If, while waiting, you realize you forgot to photocopy your documents or you need to have something notarized, don’t worry. They have a photocopy and notary area at the back. When it’s your turn, present your old passport and documents to the officer, who will then check for completeness and validity. I had to wait for more than 15 minutes because there were only 3 people behind the windows. It was Friday, maybe everyone else went on an extended lunch hour. The officer only made a cursory check of my docs and in less than 5 minutes, I was out of there and headed to the cashier. 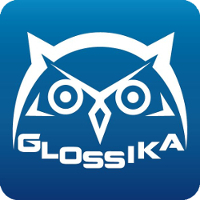 Step C: Payment – This is probably the fastest step. Pay Php 950 for regular processing (15 working days) or Php 1,200 for express processing (7 working days). 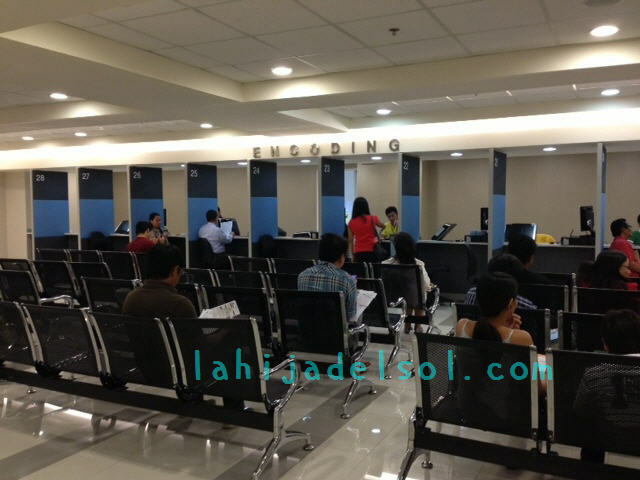 Step D: Encoding – After paying, you need to wait again at the Encoding area, which is a room as large as the Processing area. At the encoding desk, the officer will input your details into the computer and you need to verify it before you electronically sign. He/she will also take your picture. Take note that your ears must not be hidden and your hair should be swept away from your forehead. You will also be instructed to remove large pieces of jewelry that may be seen in the photograph. You may smile but don’t show your teeth. Just a personal opinion…the people in this section are the least nice. Some of them are very crabby. Not unlike those encoding people from back in 2008. This is the last step if you are coming back to personally pick up your passport. If otherwise, head over to the Courier section. That’s it! All you have to do is sit pretty at home and wait for your nice smelling passport. While waiting, why not…Google some new places to visit? It only makes sense to fill up your new passport with stamps and visas. Wow is the word in our experience in my and wife’s passport renewal. Except for the quite rickety benches, all went impeccably flawless. I would rate their system as 9.8 out of 10. Hi po… I have completed all the suporting documents for new applicant.. But i dont have any primary id yet…is it acceptable? Hello Maam Catchan, ang flight ko pabalik ng KSA ay sa August 31 na po. Kelangan ko sana ng mas maagang date of processing ng passport ko foe renewal kaso ang available na schedule sa SM Megamall eh September na po. 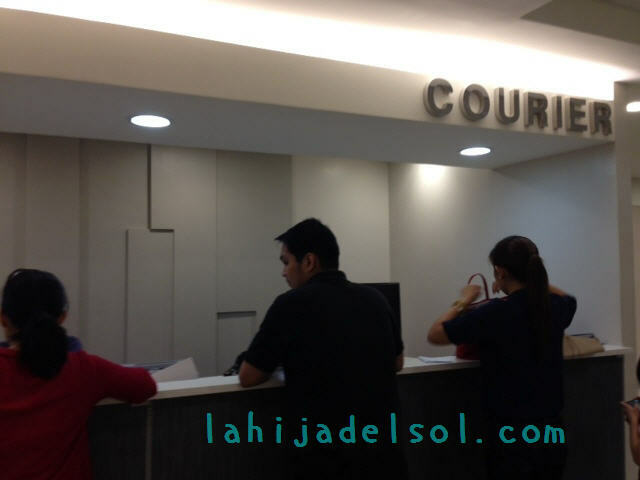 PANU PO BA MAKATAWAG SA DFA OFFICE FOR AN EARLIER SCHEDULED APPOINTMENT at maagang release? I am from Subic Zambales. Awaiting foe you immediate response. Thank you po. 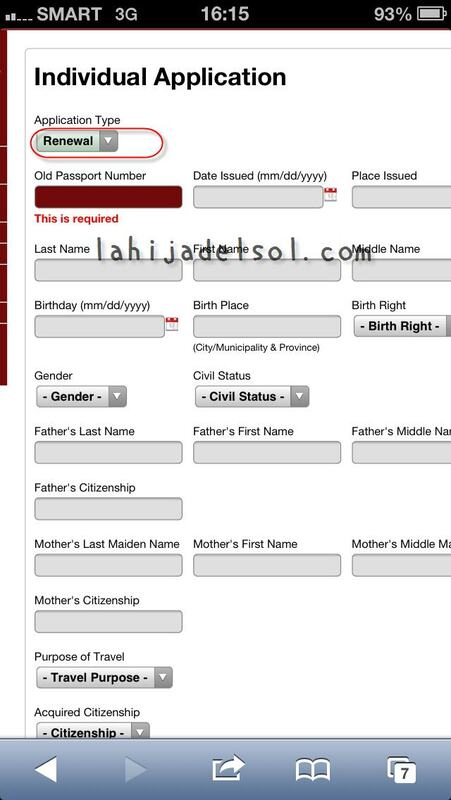 What is the earliest date to renew the passport?? good day! 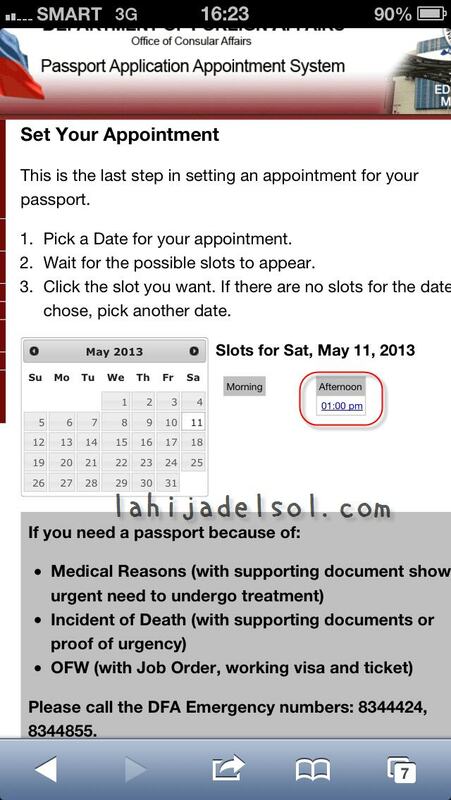 ask ko lng ksi magpapa appointment sana ko ng passport kya lng ung month ng march ayaw naman mag appear feb lng nandun then wla na rin slot. panu pa ko makakapag set ng appointment kung wala ng available slot ng feb.
Hello Kaye! Baka kaya ganon ay wala na talagang available na slots sa Feb at March. Nakita mo na ba yung April schedule? Good luck! Hi Rocky and thanks for sharing your experience. Our passporting system is indeed becoming world class! Agree with you on the benches. If someone fidgety is sitting on the same bench, you feel the “tremors”. Hello Izzy. Sorry I don’t have their contact info. Have you tried their hotline? It’s on their website. 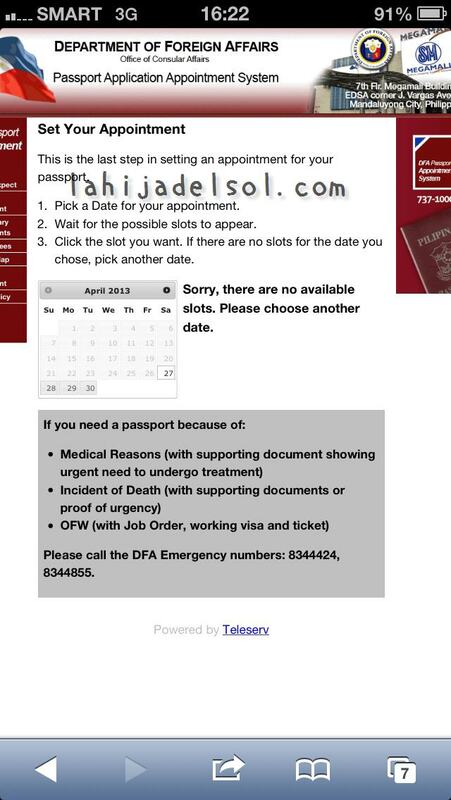 Hi, call 234-2478 (DFA Megamall) to follow-up status of your passport. May sumasagot diyan. Katatawag ko lang kanina. Thank you, Jing, for sharing this info! Delay po yung delivery ng passport ko nong 20 pa ako komoha.. dapat 27 nandito na 28 na ngayon wala pa hapon bukas 29 na.. pina express kona nga.. wala naman contact number para matawagan ung lbc..
yung po bang police clearance or brgy clearance pwede kung saan ako nakatira ngayon hindi ung sa address sa birthcertificate ko? Hi Marlon. Sorry I am not 100% familiar with the requirements for new applications. Please check the website for the complete list of requirements. Thank you! I’m still a college student, and I am afraid I do not have at least 3 of the given supporting documents. What I do have is my Form 137 from my High School, plus my college ID, NSO Birth Certificate and of course, my old passport. Are these enough? My friend said she only had her college ID and her NSO Birth Certificate and everything went well. Please enlighten me. Medyo nawiwindang lang kasi ako. Haha! Thank you! Hello Jhao! Yes, all those docs you mentioned will be enough for passport renewal. Tingin ko di ka naman magkakaproblema Good luck! Are the supporting documents required for the renewal??? I don’t have at least 3 of them. I’m still a student. Please reply. Thank you…..
Hello Pat. Bring your school ID that shows your correct name and picture. Also, it would help if you can bring your transcript of records (if university level) or form 137 (if high school). Good luck! Hello Duds. The supporting docs are not needed as long as you have valid IDs that show your correct name, date and place of birth, picture and signature. Usually, your old passport and driver’s license will be enough (like in my case). Good luck! pwede phow ba ung form 137 4 valid id..
Hi Eppie. Natry nyo na po ba tumawag directly sa DFA? Usually kasi 2 weeks yung delivery time ng passport, unless nagpa-expedite ka. Good luck! Hi sir/maam, nag fillup po aq ng renewal sa passport q pru wla man aq na tanggap na reply from dfa na appointment schedule. Hi Trece, nung nag fill up kayo ng form, wala naman po bang error message na lumabas sa screen mo? Pacheck na din po ng Spam folder nyo sa email, baka accidentally napunta ang DFA reply dun. Good luck! Hello JR. I think OK na yung mga sinabi sayo kung wala naman aberya sa old passport mo and birth certificate. Good luck!